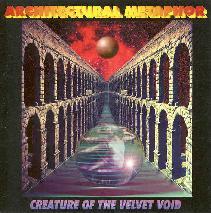 Architectural Metaphor - "Creature Of The Velvet Void"
Massachusetts-based Architectural Metaphor plays pure cosmic space rock. The band consists of Deb Young on vocals and percussion, Paul Eggleston on keyboards and electronics, and Greg Kozlowski on guitars. The actual equipment list is too long to list here, but constitutes a virtual arsenal of instruments and effects. After repeated listens to this CD it is clear that none of these devices are collecting dust in some corner. Arch Met's brand of space rock is rarely fast paced. Rather, the focus seems to be on utilizing and experimenting with their storehouse of sonic tools to produce a wide range of sounds. The disc opens with "Creature", a heavy, droning Hawkindish tune. All kinds of electronics are layered over a repeating two note keyboard line. Deb Young's vocals have a trippy 60's psychedelic quality to them that really fits the music. On the dreamier "Holographic Caves", a showcase of sound textures, the vocals soar along more like an instrument than a voice. "Kairos" and "March Of The Wooden Potatoes" both sound like Tangerine Dream influenced space trips. Kairos evolves into a heavier psych jam, while March shows how awesome just a few guitar notes can be when each is fully stretched, bent, and then set free to soar into the cosmos. One of my favorites on the disc is "Holy Ground". One of the more acidic tunes, I like the vocal effects as Deb's voice is efx'd with eerie results. The song would make a great theme to a dark sci-fi flick. The CD also features two cover tunes. Arch Met does a trippy treatment of The Velvet Underground's "All Tomorrow's Parties". They also do Hawkwind's "Golden Void". While it features less sound experimentation than the other songs, Golden Void is a twelve minute jamming rocker of a tune. Greg Kozlowski's guitar stretches out like nowhere else on the disc. Architectural Metaphor is clearly at their best when utilizing the various devices at their disposal. If you like creative, spacey, psychedelic sound explorations you should check them out. For information on this CD and it's availability, visit the Black Widow label web site.